Many companies are still holding onto traditional paper workflows, risking being left in the dark ages and losing both customers and staff to digitally competent competitors. Here’s how traditional paper processes add up against digital workflows. The company sends a form for completion by email or post. The signer prints and signs. The recipient faxes, mails or scans and emails it back. The company receives and reviews the form. The company countersigns and scans for storage, prints or photocopies, posts or emails back to the recipient. Copies are made to give to anyone in the workflow. The company then physically stores the document – in many cases never to be looked at again. Note that this process checklist doesn’t account for potential processing errors along the way or the added difficulties when there is more than one signer. 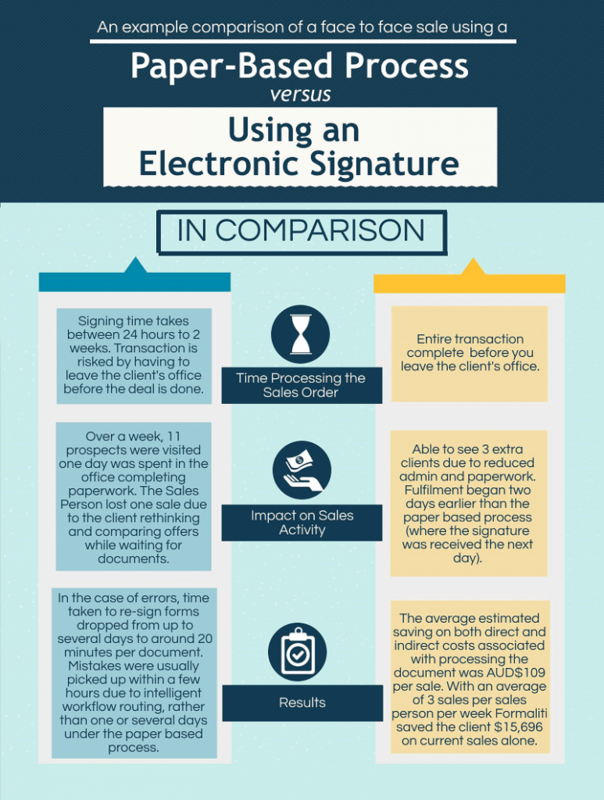 The company logs into the e-signature platform, prepares the document and sends it to the signer. The company accesses the document audit trail to see any progress on the signing. The signer completes and returns the document on their device. The company reviews and completes the document online, triggering automated copies to be sent to the customer and anyone in the workflow. The document is automatically stored online. Note that if there are multiple signatories required, they are simply added in at the initiation of the document and everyone receives a copy to sign at the same time. If there are changes to the document they can be made live. Overall, it can be discovered that a digital workflow can save time, paper and be more efficient. However, industries all around the world are still using the old traditional paper workflow which is outdated and inefficient. Welcome to the future, where all documents and signatures are digital and time is saved! Formaliti’s online software holds all of the documents you need to have signed and filled in by your customers, suppliers and staff. You use it to send and present forms to your customers for completion anywhere, anytime. It also tracks all document activity and allows the right people to have access where and when they need it. Get in touch with the team to find out how!